Great news! We’ve teamed up with 3D-printing marketplace and community Spyder 3D World to offer you new and improved 3Dponics digital designs. The mechanical engineers at Spyder 3D World have graciously tweaked our original files so that they rest better on the print bed and print more smoothly. The results are awesome, and we’re thrilled that the Spyder 3D World team took the initiative. It proves that open source really is one of the best ways to achieve innovation. 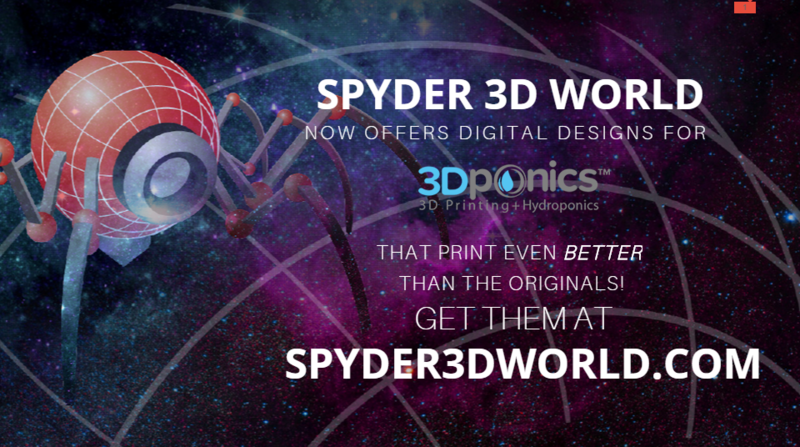 Visit 3Dponics on Spyder 3D World. Download the digital files you need…for free! NEW!If you need custom parts and hardware for your garden, you can now do so with the 3Dponics Customizer, a web-based tool that allows you to modify the original 3D models to meet your design specifications. From what we’ve seen, Spyder 3D World is always experimenting with new 3D-printing techniques with the ultimate goals of improving print quality, reducing print time and minimizing the risk of print failure. What we really love is that their core beliefs are in line with ours—users are encouraged upload, share, interact and collaborate on projects. In other words, there is spirit of innovation through collaboration. From the S3D Academy to the database of 3D-printing services and designers, Spyder 3D World is clearly dedicated to serving the needs of the 3D-printing community. Encouraging, especially in a world that’s so driven by profit and money. So make sure to check out the vast resources that are available on the Spyder 3D World community and don’t forget to download your upgraded 3Dponics designs! This entry was publish on June 16, 2015 / AnjaP. Posted in News, partners. Bookmark the permalink.